Babies are born with millions of neurons (brain cells), but they are not yet wired together. Your baby's brain and nervous system mature as their neurons connect up and become insulated with a fatty coating called Myelin. As the neurons in your baby's brain become insulated, new areas come 'on-line'. This process occurs in waves in the brain during the first year of life. 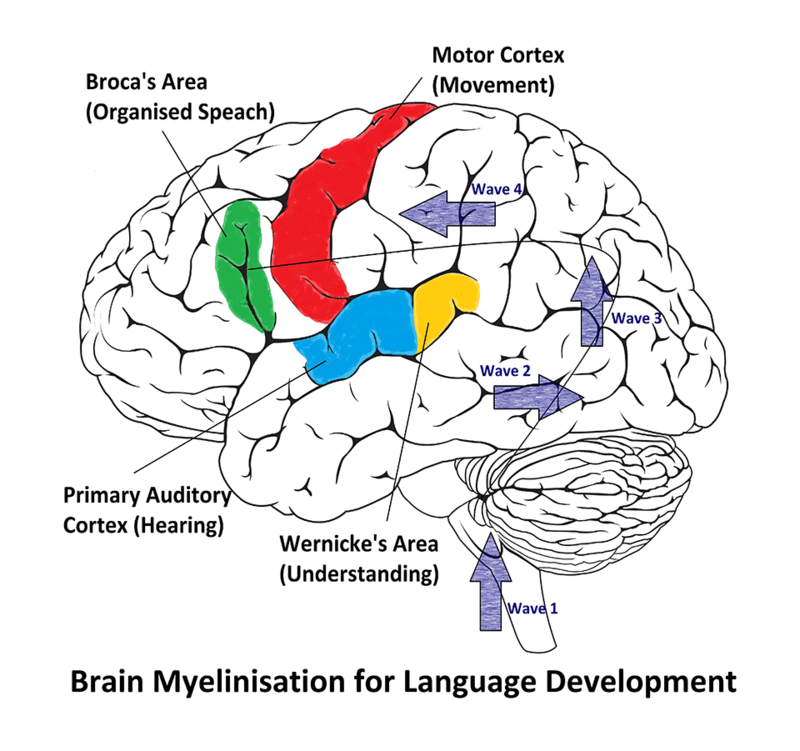 Each new wave of myelination will enable a different language ability in your baby. First comes understanding, then speach and finally sentence construction. Your baby does not have to actively learn to speak. Special neurons called Mirror Neurons allow them to learn language simply by watching and listening to the language spoken around them. The neurons your baby uses repeatedly develop synapses. A synapse is a gap between two neurons which is small enough for electrical messages to jump across. This occurs through the release of special chemicals or neurotransmitters. Synapses create connections between neurons. They are developed through experiences which involve repetition and emotion. The number of synapses in a child's brain peaks within the first few years of life, but then declines by about one third between early childhood and adolescence. The neurons your baby uses repeatedly also develop a fatty, insulating coating called ‘myelin’. Myelinated neurons are extremely fast, making a task feel effortless compared to doing it with slow, unmyelinated neurons. When your baby is born, only the neurons in the brain stem are myelinated. Thes myelinated neurons allow your baby’s nervous system to perform important autonomic functions such as heart rate, breathing, swallowing etc. This is the first wave of myelinisation in your baby’s brain. The second wave of brain myelinisation travels backwards through the brain and includes Wernicke’s Area. Wernicke’s Area is a language centre which enables us to understand the meaning of words. This is why babies are able to understand words, before they are able to speak. The third wave goes upwards towards your baby’s motor cortex. This wave makes it possible for your child to move the parts of the body involved in speach voluntarily. The fourth and final wave travels to the front of your baby’s brain and includes Broca’s Area. Broca’s Area is a language centre responsible for organising language and enables your baby to put words into sentences. Your baby does not have to try to learn how to speak. It happens almost effortlessly when they are surrounding by and can hear spoken language and this may be due to their mirror neurons. All primates are born with mirror neurons. Mirror neurons activate when you watch others seek rewards or risk pain. Watching this kind of behaviour in others, stimulates the same neurons to fire as it would if you were actually doing the behaviour. This builds neural connections and makes it easier to perform the behaviour. Mirror neurons are designed to enable your baby to learn survival relevant information via their sense of sight. Your baby learns social skills in the same way. They watch you interact with others and their mirror neurons trigger trust when they see you trusting, and fear when they see that you are afraid. Researchers believe that your baby’s mirror neurons may be the tool used by the young brain to acquire language simply by hearing and watching you speak. Table 1. describes the ages and stages of your baby's development of language. The connecting point between two neurons. Numbers peak within the first years of life. Neurons which allow babies to learn survival information (language) by watching and listening to others.